North and south are directed towards the north and south poles of the Earth. The Earth's rotation defines east and west. The sun rises in the morning in the east, and sets in the evening in the west. If a needle is magnetised and allowed to move freely (for example floated on water) it will align itself with the Earth's magnetic field which is almost in the same direction as north. 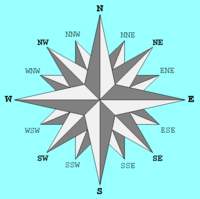 The direction of the needle in this situation is called magnetic north which in some places differs from the direction of the North Pole by a few degrees. This page was last changed on 29 December 2017, at 05:59.